When the UNESCO accepted the full membership of Palestine last year, the US and Israel raised hell. The US decided to cancel the funding it gave to the UNESCO, which amountsed to some 20% of the UNESCO’s annual budget. Now the UNESCO ‘strikes’ again, declaring the ‘Birthplace of Jesus’ as a World Heritage Site, being the first such site in Palestine. Funny enough, Jerusalem itself (which is only 10 kilometers away from this ‘Birthplace’) is a UNESCO World Heritage Site under…Jordan! 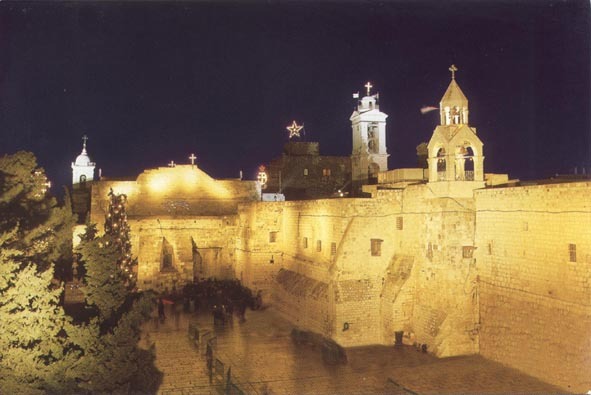 The Birthplace includes Church of the Nativity and the Pilgrimage Route, Bethlehem. Other places added to the List yesterday include Rabat in Morocco. As Egyptian, I find hard to believe that Morocco should have more UNESCO World Heritage Sites than Egypt! 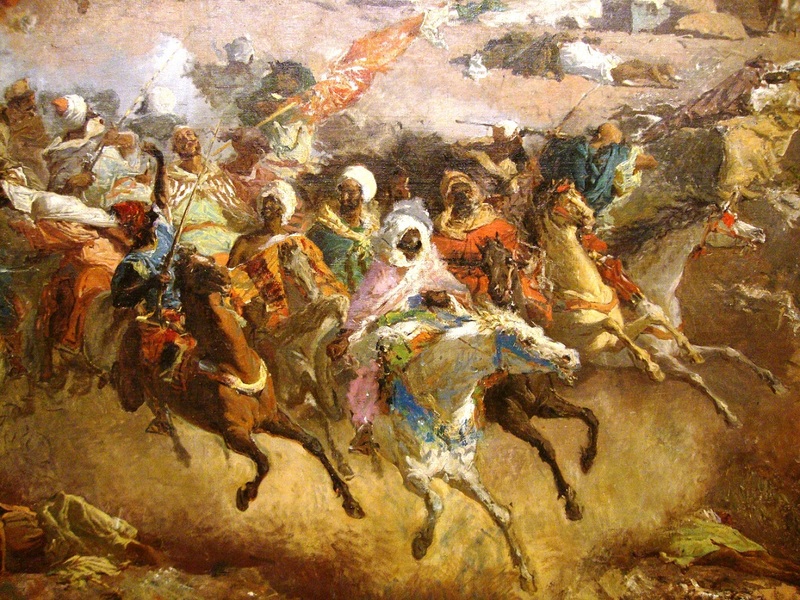 (Morocco now has 9 sites, Egypt has 7), but it was never about the quantity. Back to the Birthplace of Jesus, the US and Israel expectedly accused the listing of the site by the UNESCO as being ‘politically motivated’. Is there anything on earth that does not involve politics one way or antoher? Is there any doubt that a site like that should not belong to humanity at large? Chapeau to the UNESCO for ignoring the criticism and for listing what truly needs to be protected in Palestine, a church and a pilgrimage route that belong to us all: a world heritage site. While some countries are discussing whether imprisonment is any good at all to rehabilitate prisoners, Brazil adopted a very interesting approach that allows inmates to shorten their prison term by 4 days a year for each book they read (with a maximum of 48 days a year, corresponding to 12 books). 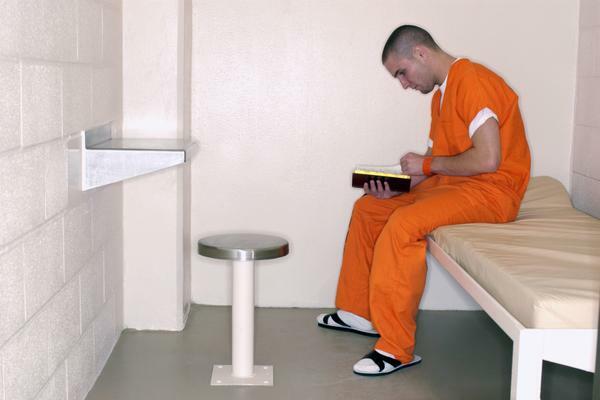 They call this program ‘Redemption through Reading’, and the idea is to ‘change’ the prisoners’ mentalities and broaden their cultural horizon so that, upon serving their term, they leave as better persons. To make it meaningful, they must deliver a proper essay for each book they read, and they get to develop their writing skills as well. Who chooses the books they read? On what basis? What about those who are illiterate or blind? Why can’t someone read and write for them? Or will they be punished twice? What happens when the prisons are no more ‘overcrowded’? Why only reading? What about listening to and playing music? What about photography, painting, writing poetry? The questions are many, but the initiative is definitely interesting. Culture has the power to change lives, and prisons are a good place to put that into use…that is, if you believe that prisons are any good to start with. Another article of mine was published by Ahram Online, this time about four Pharaonic temples, namely Dendur, Taffeh, Ellesiya and Debod. What do New York, Madrid, Leiden and Turin have in common? As strange as it sounds, all four cities have pharaonic temples. 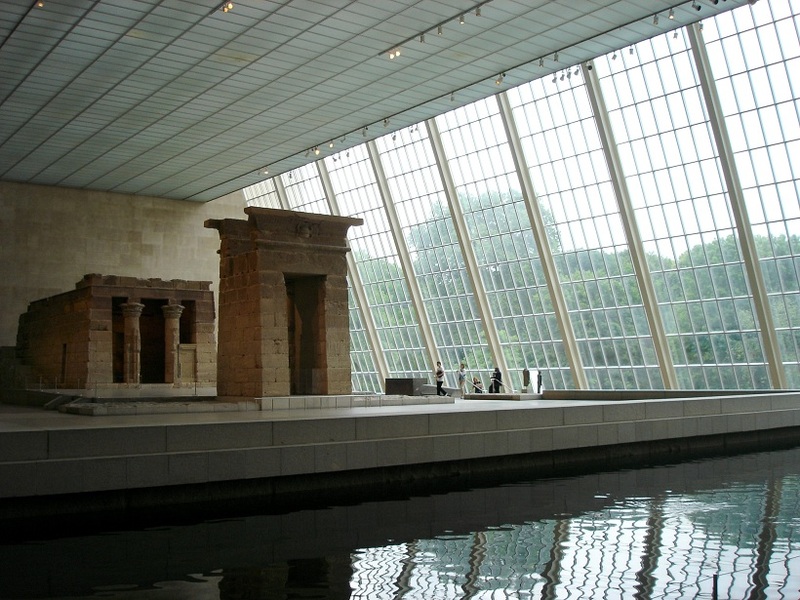 While some Egyptians like to think of these temples as ‘cultural ambassadors’ abroad, others tend to feel uneasy about the fact that Egyptian heritage could be ‘gifted’ without the stakeholders (Egyptians) being consulted. Pre-historic Art represents the dawn of human creative imagination and artistic expression: It is to Art what Genesis is to the Bible. Evidence from some caves suggests that those who painted them used ledges, scaffolds and platforms to paint the ceilings, and the degree of complexity and quality of some pigments used suggest that Pre-historic painters had assistants! People grinding the pigments, binding them, preparing brushes, setting platforms, filling the lamps with animal fat, to the end of the laborious job. Can you imagine a cave man lying on his back on a ledge to paint a cave ceiling? Isn’t it what Michelangelo would do millennia later when he painted the Sistine Chapel in the Vatican? 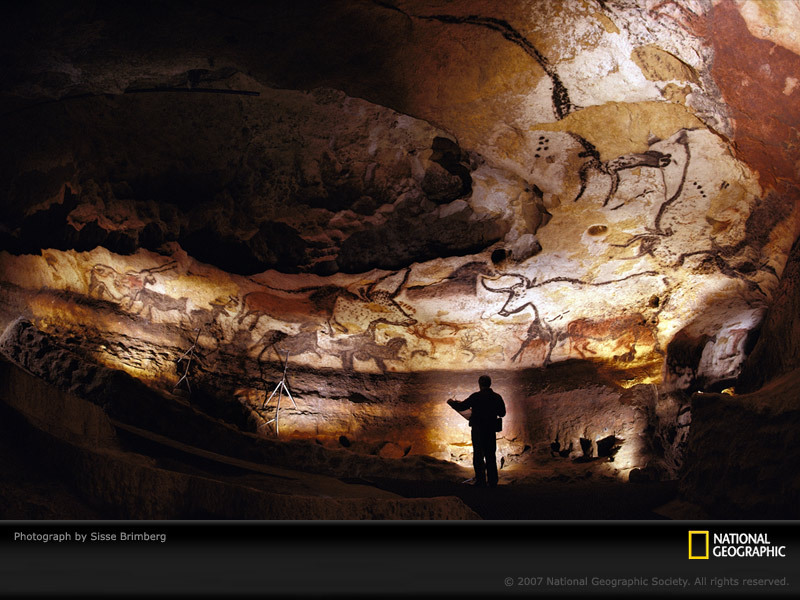 They had no idea that they had just “discovered” the most famous rock art site on Earth: “Lascaux Cave” in France. She had just discovered “Altamira Cave” in Spain. In 1994, 3 scientists were exploring a cave when, feeling a breeze, they discovered a network of hidden chambers. Before their eyes, there were bears, horses, cave lions, mammoths, and more! They discovered “Chauvet Cave” in France. In 1932/1933, the Hungarian Laszlo de Almasy (the English Patient) –while supposedly searching for the lost oasis of Zarzora- discovered paintings of people swimming in a cave. He named it “Cave of the Swimmers” (in Egypt). Cave Art appeared before Homo Sapiens! What was there before the Cro-Magnons (early homo sapiens sapiens? Well, another species: the homo neanderthalensis. What were these Neanderthals like? Well, they were…artists! Or so it would seem following the latest dating of some Spanish cave art samples. 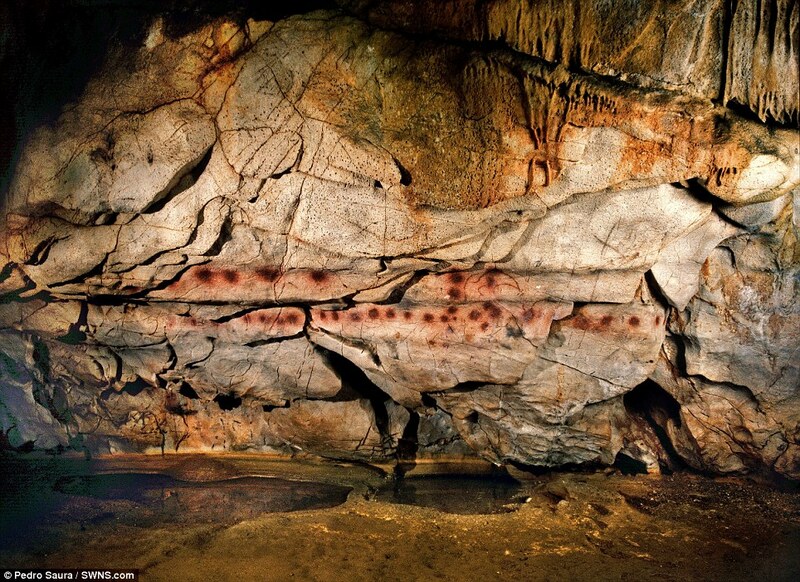 For decades, the cave paintings of Altamira and other Franco-Cantabrian caves have amazed people worldwide. Art historians celebrated them as man’s oldest creative artistic expression. But now there is a possibility that some of them were not done by man the way we understand him (he species homo sapiens), but rather his predecessor: homo neanderthalensis. The polemic arose following the application of a refined dating technique to a sample that turned out to be some 41,000 years old (at El Castillo Cave, Spain). 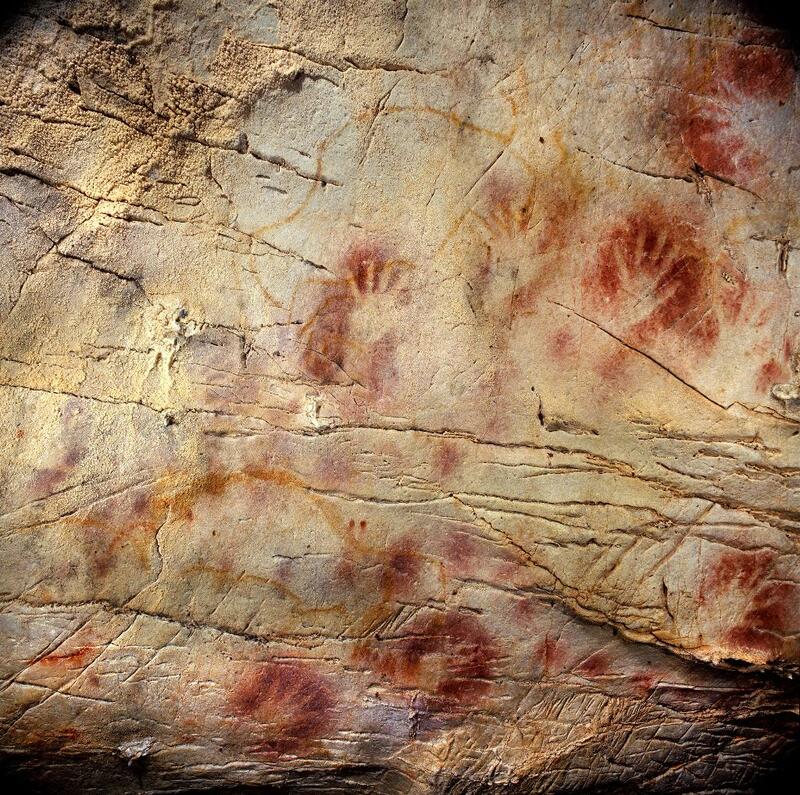 So, we (homo sapiens) did not ‘invent’ art? For the moment, there are doubts, but if any sample from the cave art yields a dating that exceeds this mark, there will be no room for doubt about art predating modern man. 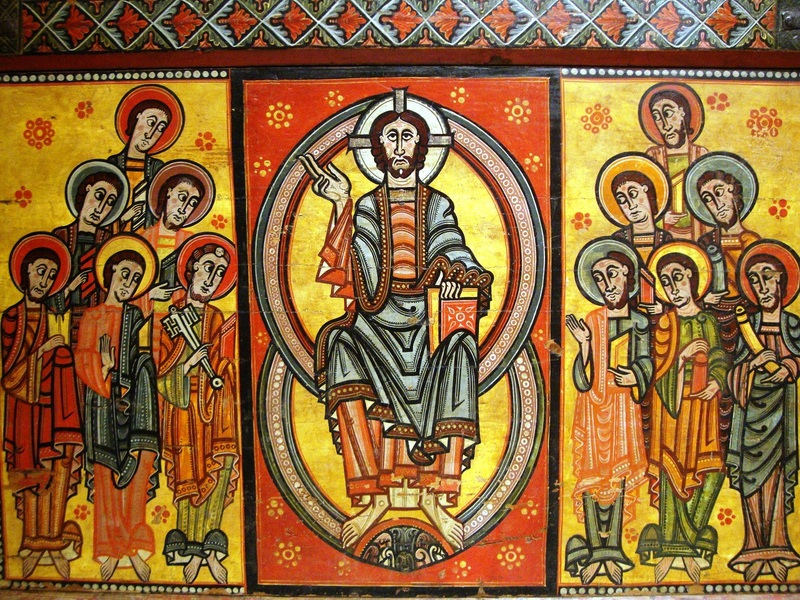 One of the most common motifs in Romanesque Art is ‘Christ in Majesty’, where Christ is depicted in full frontal view, with the Gospels in his left hand and his right hand blessing the viewers. 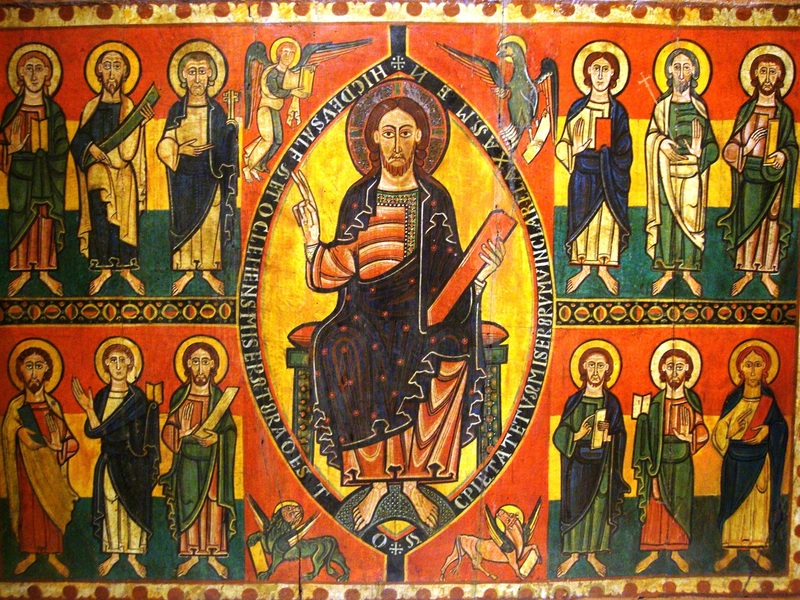 Christ appears in a mandorla (almond shaped frame), surrounded by the four living creatures that symbolize the four evangelists: The Lion (Mark), the Bull (Luke), the Eagle (John) and the Winged Man (Matthew). 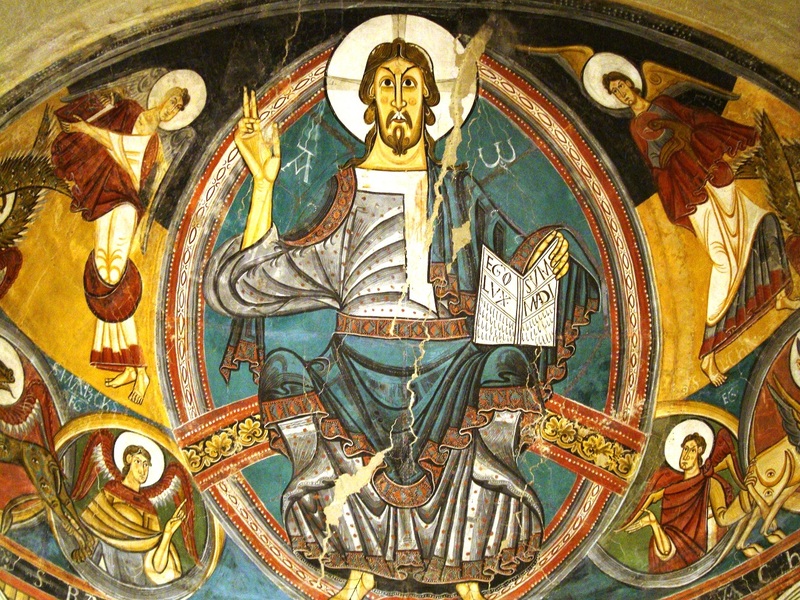 This motif, an iconographic evolution of the earlier ‘Christ Pantocrator’, can be seen in apses (as mural painting), in tympanums (as relief) and in elsewhere in Romanesque churches, but nothing comes even close to the absolute masterpiece of Catalan Romanesque: The mural of the central apse of Saint Clement de Tahüll. 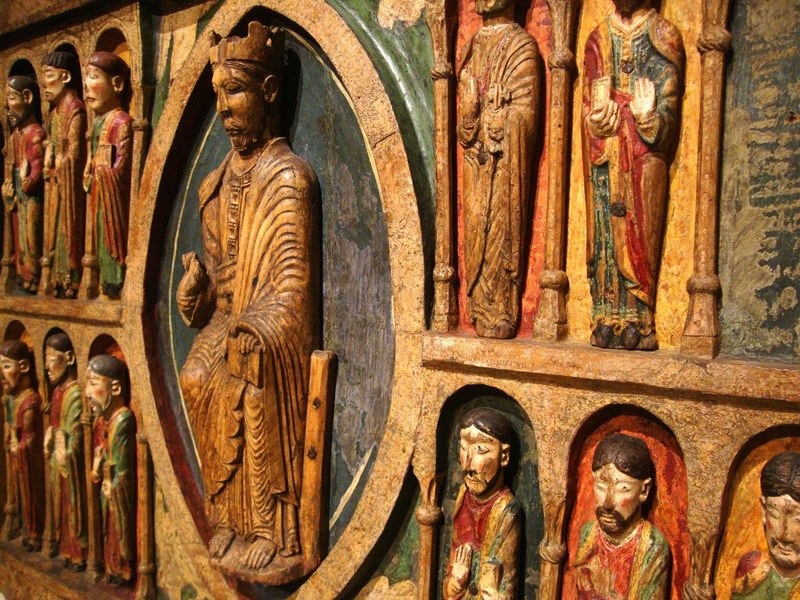 The piece, exhibited at the MNAC (National Museum of Catalan Art) in Barcelona, comes from the central apse of a Romanesque church consecrated in 1123 in the Boí Valley in Catalonia. The intentional absence of any naturalism is somehow exaggerated, probably in an attempt to stress the estrangement from God. The Holy Book in Christ’s hand is open, and it has a clear phrase: Ego Sum Lux Mundi (I am the Light of the World). This piece is not the only Romanesque marvel at the MNAC. Other pieces include murals from Santa Maria de Tahüll, Seu d’Urgell, Maria del Castell de Besora, etc. Also, some great examples of wood carving and sculpture are on show. Catalunya is a heaven for Romanesque Art lovers, and Barcelona has quite a big share of that. 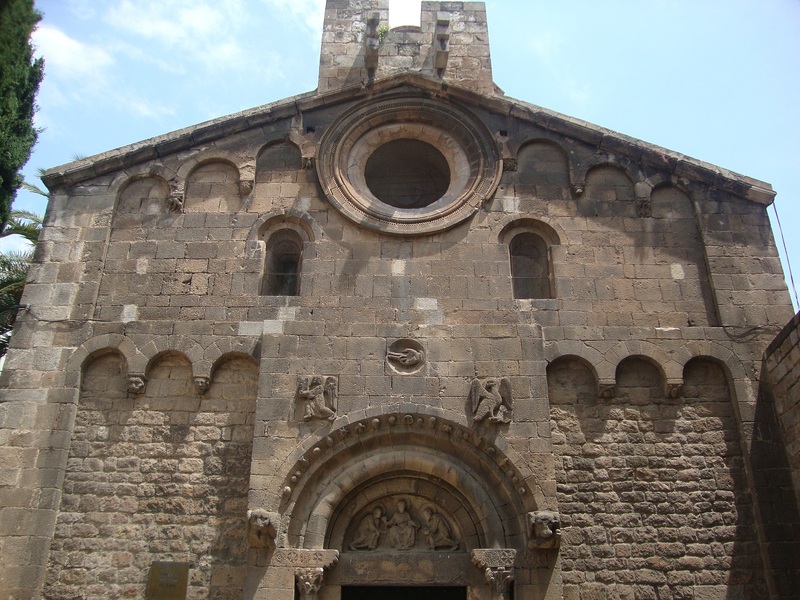 The city’s oldest church is a Romanesque one, Sant Pau del Camp, a hidden and forgotten treasure in El Raval district. Once destroyed by Almanzor towards the end of the tenth century, it was later rebuilt following the original model. 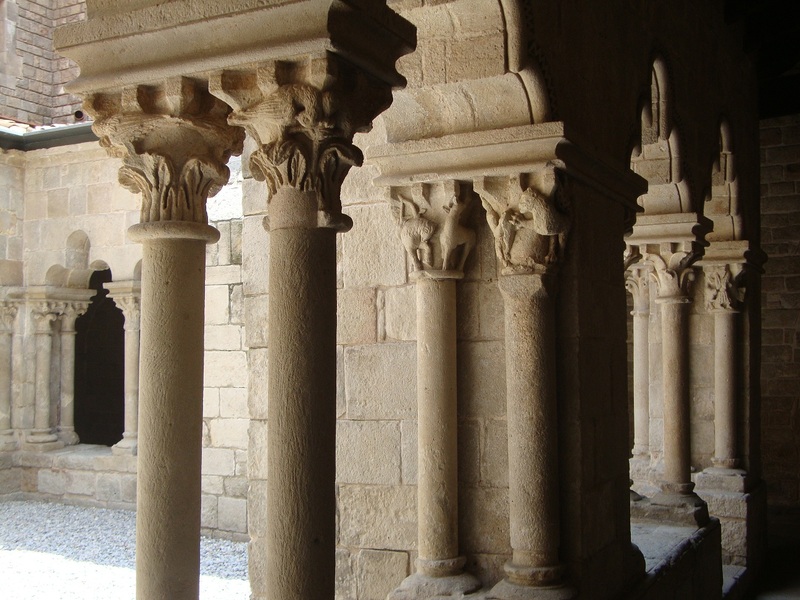 The cloister and the tympanum are the main ‘aesthetic’ attractions here, with interesting iconography in the cloister’s columns (the capitals show intricate figurative art resembling an illuminated manuscript…another characteristic of Romanesque art).